I had hoped to get my Happy Homemaker Monday up this morning but the day just seemed to get away from me! I had some cards that absolutely had to get made and mailed today so was busy in my craft room until time to go to town. Oh well, it's still Monday so here goes! 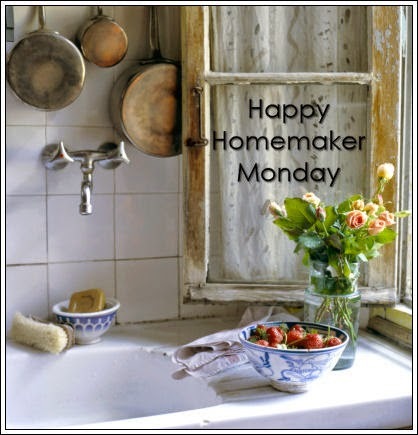 A big thank you to Sandra at Diary of a Stay at Home Mom, our weekly host for Happy Homemaker Monday! Today was beautiful! 80 degrees (F), blue sky, low humidity...perfect! Our garden is beautiful; everything is growing and producing! Sitting in my bed waiting for hubby to get finished with his work. About what needs to be done before I leave for my daughter's on Thursday. We are still binge watching Royal Pains! Rocky snoring at the foot of my bed! Still working on a baby girl afghan but the baby girl turned into a baby boy! LOL Sooo, when I finish this one I need to start a baby boy afghan! Knitting or crocheting! It is so relaxing and I love how you can turn yarn into something useful with knitting needles or a crochet hook. Instead of using the expensive Jet Dry in the dishwasher, try plain, old, ordinary, white vinegar! It works just as good and costs a whole lot less!!! Things are a little messy after a busy day but not to worry; I will clean it all up tomorrow! I don't have anything today. Hubby took a lot of pictures of the garden but I haven't downloaded them to the computer yet. Maybe I need to add that to my "to do" list. Friends and family who need healing. Well, that's it for me today! See you tomorrow with a card for The Cupboard Trilogy Challenges! I'm sure that baby will appreciate the afghan, even though he turned out to be not quite as expected! His big brother loved his! The parents sent me pictures of Zack with his afghan and said he uses it all the time!